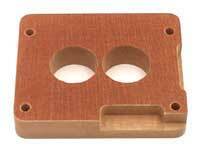 1" Tall Phenolic Carb Spacer for Holley 2bbl - 3 1/2" x 5 5/32" bolt spacing. Phenolic material is far better at rejecting heat than plastic and aluminum. This spacer is a favorite among Ford 2bbl racers. For more hp see our specially ported #PS113-P spacer.